A Breakthrough in Brexit Talks – But is it Good News? Today is a momentous day in the Brexit negotiations. Very early this morning, Theresa May and David Davis travelled to Brussels to meet with Donald Tusk and Jean-Claude Juncker for the UK Government and the European Commission to reach an agreement on Phase 1 of the Brexit talks. An early morning tweet of an image of white smoke from EU official Martin Selmayr, was a sure sign of progress – but is it all good news for Brexit? The deal covers 3 aspects: the financial settlement, citizens’ rights and the Irish border. After weeks of intense negotiations between London, Brussels, Belfast and Dublin, the European Council is set to sign off progress to Phase 2, covering the transition and future trading relationship, at its meeting next Thursday and Friday. On citizens’ rights, both sides have agreed a framework for EU citizens living in the UK and British citizens in the EU. Importantly for our security, negotiators have agreed systematic criminal and security checks. UK courts ruling on these matters will have the ability to voluntarily refer to the European Court of Justice (ECJ), but frustratingly, this will be for a period of 8 years. The devil may be in the detail to see how this may impact on other aspects of our involvement with the ECJ, such as in aviation or science, and the final Brexit divorce bill! The federalist MEP Guy Verhofstadt is still not happy with these guarantees and has demanded 5 fresh concessions from the UK, including giving rights to spouses and families to join EU citizens in Britain. Although he claimed Britain has made enough concessions for the European Council to sign off the deal next week. Perhaps the most contentious issue has been the border between Northern Ireland and the Republic of Ireland, both sides wanting to ensure a hard border is not re-established. The Democratic Unionist Party scuppered the deal earlier this week in a last minute phone call in the middle of May’s lunch with Juncker on Monday, with Arlene Foster claiming the DUP had not been properly consulted over the agreement being offered to the EU. However, this now seems to have been resolved with the EU, the British and Irish Governments and the DUP seemingly satisfied. Unless better solutions are found during the next phase, the UK “will maintain full alignment with those rules of the Internal Market and the Customs Union” which support the all-island economy and the Good Friday Agreement. Let’s see if this provokes further outrage from other sections of the United Kingdom. As far as the financial settlement is concerned, apparently this will be around £35-39 billion (payable in instalments over many years), which Theresa May believes will be acceptable to the British taxpayer. Far too much money as far as we are concerned, but much less than has been rumoured! As a matter of urgency, the Prime Minister must inform the British people what exactly this money will pay for. The UK has committed to continue paying into the EU budget as normal until the end of 2020, beyond the exit date of 29th March 2019. This means access to the Single Market during the proposed transition period, and no time-limit has yet been set on this, or even a commitment to actually sign a trade deal before the transition period starts, so we could end up with this going on for years and years unless this is seriously addressed in the next phase. We must continually push to make this clear, otherwise we must still be prepared to walk away without a deal. We have written previously about there being nothing to fear from adopting WTO rules, and in many cases, we would be far better off than tying ourselves into knots in the future with the EU shackled to our ankles. Get Britain Out is particularly concerned about the commitment to “full alignment” with certain Single Market regulations, with apparently no time limit. This would potentially hinder our ability to sign trade deals with non-EU countries. It would place further unnecessary constraints from EU Directives on the 90% of British businesses which do not trade with the EU. As Daniel Hannan MEP has pointed out, most firms trade within ten miles of where they are sited. On some fundamental issues like the Irish border, this latest document seems to kick the can down the road and these need to be addressed in Phase 2. The Government must now push for a full trade agreement with the EU, to be finalised before the start of the strictly time-limited transition period. This final arrangement must give us freedom from regulatory alignment, in order to be able to negotiate comprehensive trade deals with countries around the world, fulfilling Theresa May’s vision of a Global Britain. We need this regulatory freedom as soon as possible, because if President Trump is not re-elected in 2020, the new US administration may be less enthusiastic about a UK-US deal. Donald Tusk has suggested the transition will be discussed as the first item on the agenda - before the trading relationship. It is vital we do not get distracted by endless talks about the unwanted transition period! 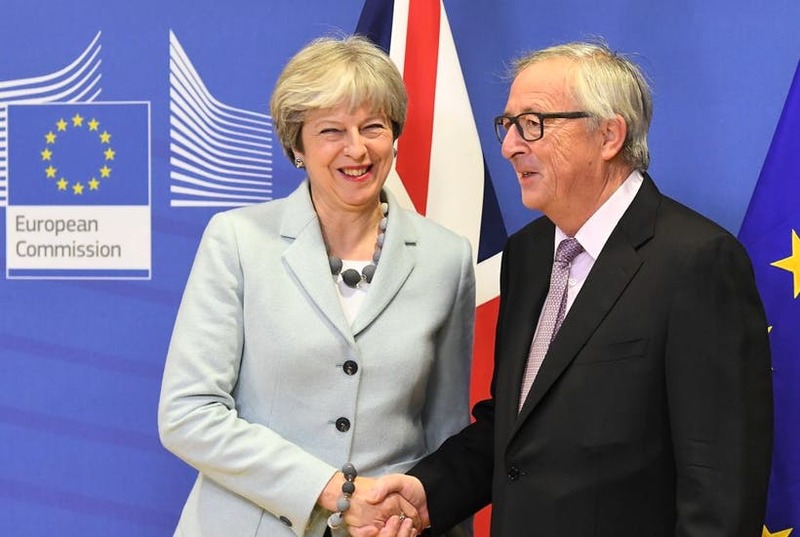 Perhaps most importantly, the text of the agreement repeats Theresa May’s now well-known negotiating phrase: “nothing is agreed until everything is agreed.” This crucially leaves open the possibility of No Deal, which may be necessary since the agreement so far outlined raises many questions, and there are still potential hostages to fortune. We need much more clarity on many issues. Conservative Brexiteers welcomed the agreement. Boris Johnson tweeted his congratulations to the Prime Minister and reiterated his commitment to “taking back control of our laws, money and borders for the whole of the UK.” On the other hand, some Leave campaigners are unhappy. Nigel Farage has called it a “humiliation.” He has criticised the involvement of the ECJ, the prospect of paying nearly £40 billion and the commitment to follow Single Market rules. He wants the Government to walk away from negotiations if EU negotiators do not drop their demands in these areas. Meanwhile in Parliament, the EU (Withdrawal Bill) has so far escaped Remoaner attempts to amend it to soften or scupper Brexit. The all-important final vote on the Committee stage of the Bill will take place on Wednesday, 20th December. Get Britain Out will be sending out a special e-Bulletin next week with information on how your MP has voted following the recent debates on the Bill and suggesting how you can pressure your MP into backing a real Brexit in this important vote in the House. MPs need to know how much you care about this issue, even if they have not supported Brexit in the past. You might like to know that 7 out of 10 Labour constituencies voted for Leave in the Referendum, so even if your MP is Labour, he or she needs to hear your voice. That’s it for our e-Bulletin this time and thank you for all your support. Get Britain Out is still fighting for the Best Brexit for the United Kingdom – and this means taking back control of our laws, borders, trade and our money. We are now almost into Phase 2 of the negotiations, but there is still a long way to go! P.S. If any of your friends and colleagues would like to see this e-Bulletin, please forward this to them – here’s the Sign Up link. P.P.S. We really appreciate all your support. If you have any Brexit queries, please e-mail us at info@getbritainout.org and we will do our best to help.